First monument to Omar Khayyam in Russia unveiled in Astrakhan. 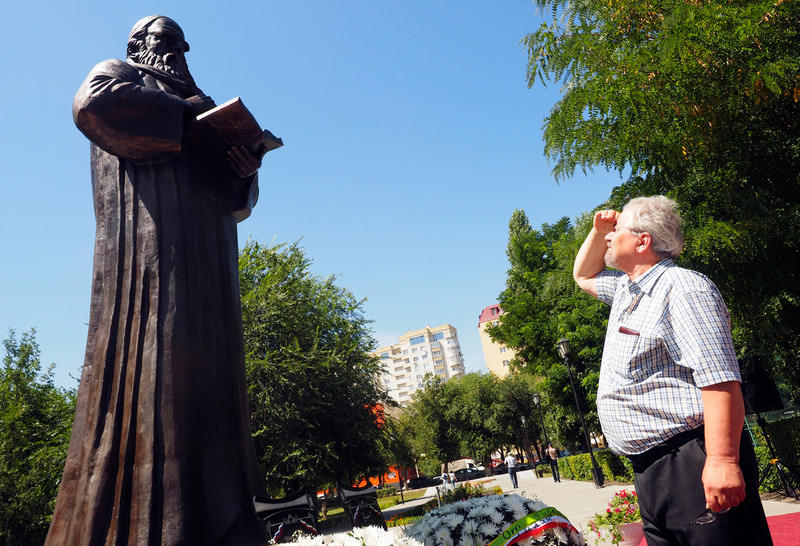 Russia’s first monument to the renowned Persian poet, philosopher, astronomer and mathematician, Omar Khayyam, has been unveiled in the southern city of Astrakhan (1,000 miles south of Moscow). Governor of the Astrakhan Region, Aleksandr Zhilkin, and Governor-General of Iran’s Gilan Province, Mohammed Ali Nadjafi presided over Thursday’s ceremony by removing a veil from the four-meter-tall bronze statue, set in the Alley of Monuments in the student garden in front of Astrakhan State University. "In Persian literature, Omar Khayyam is a symbol of wisdom, freedom and joy of life. The unveiling of the first monument to him in Russia is a great event. I do hope that it will help foster cooperation and promote further rapprochement of our countries and peoples, and expand relations in all realms of human endeavor," Nadjafi said. Zhilkin pointed out that the monument to the great Persian poet was "a symbol of sincere friendship between the two countries and its unveiling will propel it to new highs." The 1.5-tonne statue was cast in Yekaterinburg and delivered to Astrakhan’s student garden to be placed next to the statue of Khayam’s Turkmen counterpart, Makhtumkuli Fragi. The poet is depicted holding a pen and a book in his hands. The statue’s sculptor Sergey Vorobyov, of Chelyabinsk, repeatedly contacted Iranian officials to agree the details. The sculptured image is based on Omar Khayyam’s marble bust mounted above his grave in Iran. Omar Khayyam owes his lasting fame chiefly to his rubayat, or four-line verses of wisdom. In Iran he is also known as the author of the most accurate of all calendars. As the Astrakhan Ministry of International and Foreign Economic Relations told TASS, the Chamber of Industry, Trade, Mines and Agriculture of the Iranian province of Gilan funded the project. During Thursday’s ceremony Governor Zhilkin conferred upon Nadjafi the Astrakhan Region medal of merit. All those who participated in the project were awarded letters of gratitude. Certainly, relations between the region and Iran have grown closer. In 2014, the Astrakhan Region and Iran marked the 20th anniversary of friendly inter-regional ties. More than 160 Iranian companies including an Iranian bank branch do business in the Astrakhan Region. Back in late July, a regular air link between Astrakhan and Tehran was opened. By the year’s end, an Iranian trading house is expected to open in the region after nearly ten years of talks and coordination. In addition, plans for launching an Iranian poultry farm project are on the agenda. According to the Astrakhan governor’s press-service, the region’s trade with Iran during the first half of 2016 has totaled $74.2 million.